This year may turn out to be the worst for honey bee die-offs ever. The news out of California is very disturbing, with fifty percent projections for overwinter losses possibly turning out to be low. The official numbers haven’t yet been released. In contrast to other years, I’ve seen a shift in symptoms of ailing bees and timing of die-offs. Also, no one seems to be talking about the specific symptoms seen during postmortem. When we read coverage of huge bee losses, there seems to be a built-in assumption that the symptoms are consistent with those associated with colony collapse disorder (CCD). Although I acknowledge that I did see CCD symptoms, with bees disappearing, the majority of my losses are different. 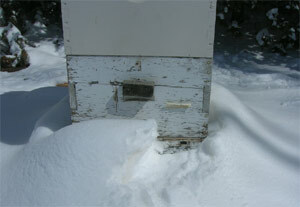 I started this past winter with 24 living colonies spread across about 50 miles. I use no pesticides, no acids, no antibiotics and no essential oils; therefore, I expect to have higher losses than those who treat. That may or may not be the way this plays out. It’s not done even now in late April. Two of my colonies died of classic CCD symptoms. There were essentially no adult bees left. There was plenty of honey and bee bread, but brood had been abandon to die in cell. In these cases, the queen was gone (this is not always true for CCD). Both died in November. Two colonies died of causes that are not particularly of concern: starvation and cold. They performed poorly all summer and were not adequately prepared for winter. They died in November and December. The remaining seven colonies died of something I’m calling “queen failure” because I don’t know of any official term for these symptoms yet. This is what I’m seeing in many cases, including clients’ hives as well as my own. The queen quits laying eggs completely, or lays widely scattered and few in number (tiny amounts of brood or none). Normal attrition causes the cluster population to dwindle, with more bees dying than are replaced by new arrivals. A pile of bodies collects out the front door. This continues even into March and April when the colony should be rapidly expanding. Food stores are plentiful, both honey and bee bread. Eventually, the cluster shrinks beyond the threshold where they can maintain temperature and they all die. The cluster size where this happens varies based on outside temperature; however, it seems consistently between grapefruit and baseball size. This has me greatly concerned. Normally, winter losses would be done by April and those are the numbers I have reported above. But my colonies are continuing to die of these same symptoms and I have clients seeing the same. I have lost four more in April. Admittedly, we have had an unusually cold April, but that does not explain the lack of brood. Healthy honey bees should be rapidly expanding their population for the nectar flow. Perhaps the queen has become unable to lay or is so ill she cannot perform her duties. Perhaps the colony has tried, without success, to raise brood (poison in the bee bread?) and they have become discouraged to the point of not attempting to raise brood. This is an appeal to other beekeepers across the country. What are you seeing? Are you aware of possible root causes? I wonder if we have finally crossed the threshold of accumulating sub lethal poisons to the point that colonies are succumbing in mass. If you have further insight into this phenomenon, please write to me at dstudin@yahoo.com. Donald Studinski spends his time as a beekeeper in the Denver metropolitan area. He offers a year-round beekeeping mentor program which involves online and in-person educational opportunities. Students participate locally and from around the U.S. You can reach Don at dstudin@yahoo.com or using 303-248-6677. His website is HoneybeeKeep.com.